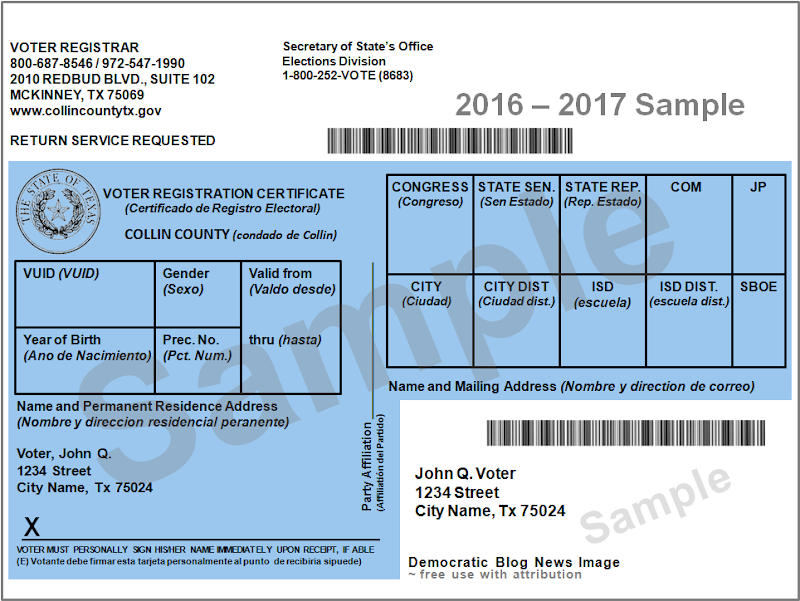 New blue color certificates were printed by the election registrar office of each Texas county and mailed between November 15th and December 5th. Voters whose renewal certificates are returned to the registrar as undelivered will be placed in "suspense" by January 2, 2016, following the mailing. The certificates are valid for two years beginning January 1, 2016 through December 31, 2017. You MUST be registered to vote in the county in which you currently reside, and have a currently dated government issued photo I.D., to vote in any Texas election. You must be registered, or have mailed your registration application to be postmarked, no later than midnight of the thirtieth day before the election date. And, as of the date of this article, you are still required to present photo I.D. at the polling place to vote in person. The last day to register to vote in any election is the 30th day before Election Day.. NOTE: On August 10, 2016, US District Court Judge Nelva Gonzales Ramos of Corpus Christi issued an order prescribing what Texas voters need to bring to the polls when they vote in person. The new procedures remain in effect until further Court notice. New Procedures for Voting in Person All citizens wishing to vote must still be on the official list of registered voters. For the November 8th election, the deadline to register is October 11th. *The one-page form is called the "Voter's Declaration of Reasonable Impediment or Difficulty"
The ID address does not have to match the voter registration address. It was also made clear that the ID address does not have to match the voter registration address. Judge Ramos' order followed a July 2016 decision by the full US Fifth Circuit Court of Appeals ruling the existing Texas Voter ID requirements had a discriminatory effect and directed Judge Ramos to arrive at an interim solution. She will continue to consider the subject of discriminatory intent. Every registered Texas voter should have received their new 2016-17 blue Voter Registration Card (VRC) by the first part of January 2016, or within thirty days after you submitted your registration application. If you asked to register to vote while updating your driver's license with the Texas DPS, and you never received a VRC, your registration application may not have been processed. Check how your name appears in the white mailing address box in the lower right quadrant of your new blue 2016-17 voter registration card. This is the name that appears on the official voter roll - and that will be the name listed on polling place poll books. The name that appears to the left side of the card - in the area above the X signature line - may have former names jumbled in with your current name. This jumble of names may or may NOT exactly match the name that appears on the official registered voter roll, but some combination of the current and former names printed on the new VRC's probably will match the name listed in the poll book at the polling place. The listed former names shouldn’t negatively affect your ability to vote, and it probably will not change the number of people required to complete the name affidavit form, because the name on their I.D. doesn't match character for character the name listed in the poll book. Complete a name change online. "A voter must show one of the following forms of photo identification at the polling location before the voter may be accepted for voting: Driver's license, election identification certificate, personal identification card or concealed handgun license issued by the Texas Department of Public Safety; United States Military identification card that contains the person's photograph; United States citizenship certificate that contains the person's photograph; or a United States passport. The above identification information printed on the back of the VRC has been modified by Judge Ramos' August 10, 2016 court order as noted above in this article. Prec. No. – Your precinct is based upon your residence address and determines your election ballot style. Valid from January 1, 2012 thru December 31, 2013. Upon expiration, new certificates are automatically mailed to voters with active registrations. Party Affiliation ________ ; Texas is an open primary state, which means, Texas voters do not register with a party when they register to vote. At the time they cast a primary election ballot, they may choose which party primary ballot to cast, and sign a pledge declaring they will not vote in another party's primary, primary runoff or convention for the next two years. The party choice is then be stamped in this space on your registration card. For that two year period, voters may switch arty affiliation by completing and signing an affiliation pledge with another party, at that party's county office. This also helps ensure you will receive a ballot from the same party should a runoff election be required. If you did not vote in the initial primary, but would like to vote in a subsequent runoff, you will be able to make your party selection at that time. You must vote in a party's primary election to qualify to attend that party's senatorial district / county and state conventions. You will present your stamped registration card when you check in for the precinct convention as proof that you did vote in the primary election. BARCODE – This is the Collin Co. voter registration number which can be electronically scanned by poll workers at a polling location to check-in voters. Please DO NOT cut the bar code off of the card!! You checked the "Register to Vote" box when you changed or renewed your Texas Driver's License, but never completed the voter application process. You have moved and you have not voted in an election in the County during the past two years, your voter registration record may have been suspended or even canceled. You must contact the Registrar's office and update your registration information every time you move. To find the change of address information click here. You have not moved, but mail sent to your address by the county Election Registrar's Office was for some reason return to the Registrar's office as undeliverable mail, then the Registrar will think you have moved and the Registrar will "suspend" and eventually cancel your voter registration. Why does this happen? The most typical reason is if your mail was being held at the post office while you were on vacation and the Registrar's office sent mail to you (e.g. a new voter registration card or other voting information mailing) during period your mail was held at the post office, then the Registrar's mailing would have been returned to the Registrar's office as undeliverable mail. This returned mail marked as undeliverable causes the Registrar t think you have moved and your registration recorded will be suspended for two years and then canceled. If your voter registration record has been suspended or canceled, or you have never registered to vote in the county where you live you must take action to be properly registered as an "active voter" 30 days before the next election in order to vote in that election. 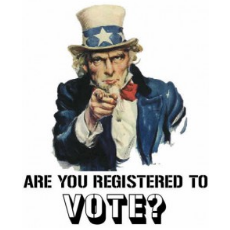 Voter Registration Applications must be post marked on or before the 30th day before election day in order for you to be properly registered to vote in the election. It is always good practice to check your registration status at least 45 day before every election by going to the Registrar's website. Have you ever registered to vote? In general, you are eligible to vote in county where you reside if you are a United States Citizen, a resident of the county, will be 18 years old before election day, are not a convicted felon and have not been declared mentally incapacitated. Please remember to take your Voter Registration Card with you to the polling place when you vote. Texas Sec. of State' Voter I.D. information webpage - click here.